The now famous Gunfight at the O.K. Corral was a shootout between lawmen and a group of outlaws called the Cowboys. It occurred this day in 1881 at Tombstone, Arizona, USA. Despite the name, this historic shootout didn't take place in or even next to the O.K. Corral. It actually occurred in a narrow lot on Fremont Street, six doors west of the O.K. Corral's rear entrance. The five Cowboys (Billy Claiborne, brothers Ike and Billy Clanton, and brothers Tom and Frank McLaury) lined against the three lawmen (Doc Holliday and brothers Virgil, Morgan and Wyatt Earp) a mere 6 feet (1.8 m) apart from each other. Some 30 shots were fired and it was all over in about 30 seconds, leaving Billy Clanton and both of the McLaury brothers dead, with Virgil, Morgan and Doc Holliday wounded. Wyatt Earp was unscathed, as were Billy Claiborne and Ike Clanton who ran away when the shooting started. The gunfight was recorded in a 1931 biography, Wyatt Earp: Frontier Marshal, published two years after Earp's death. The shootout was then made famous by the 1946 film, My Darling Clementine based on the biography. The Gunfight typifies America's Wild West and a time when outlaws often outgunned the lawman. These hard men and hard times have since been romanticised in many a Spaghetti Western. 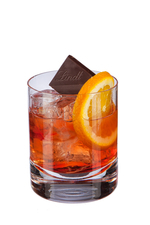 We are particular fans of Sergio Leone's Dollars Trilogy of films starring a young Clint Eastwood, so we'll be toasting those brave lawmen with a Munich Negroni served Western Style. The artist behind Gin Lane, and arguably the father of modern-day cartoons, William Hogarth died on this day in 1764. One of a series of moral works, which included the Harlot's Progress and the Rake's Progress (clue: neither has a happy ending), Hogarth engraved Gin Lane as a companion piece to Beer Street, showing how healthy beer was for the life of a city, and how bad gin was for it. Despite his pro-beer stance, Hogarth's images, with their shocking depiction of a woman dropping her baby to its death, have been widely used in campaigns against drinking in general. We are marking his death with an Ampersand, a classic cocktail based on Old Tom gin, the sweet style most likely drunk in Hogarth's day. We discovered the recipe in Albert Stevens Crockett's The Old Waldorf-Astoria Bar Book. Before the first meeting of the Football Association in the Freemasons' Tavern in Great Queen Street, London (now the Grand Connaught Rooms), today in 1863, there were no nationally recognised football rules. The game was played in schools to local guidelines but when boys from different regions met, mayhem descended, so the Football Association (now the oldest football association in the world) was formed to agree a set of rules. Original suggestions for rules allowed players to handle the ball, while Blackheath FC were very keen to keep the practise of 'hacking', or kicking an opponent in the shins. It's quite fun to think of the players jumbled up on the pitch with no common rules, so today we're drinking to that memory, and to the FA for sorting it all out, with a Tanglefoot or you may feel a Highball is more appropriate.